Western Whiskey Gazette (WWG): Awww John - Not Again!? Recently there's been quite a bit of discussion on the WBN site surrounding the (correction - thanks Charles!) SANS-serif "R". You know, the "R" embossed on many western bottles with the funny crooked right leg. Play dough style embossing and the glop top. John Thomas stated that the firm of Crane Hastings & Co. was an offspring of Giles, Hayes & Co., which dated back to 1867. He went on to state that Byron G. Crane, and Everett L Hastings were silent partners in this firm. 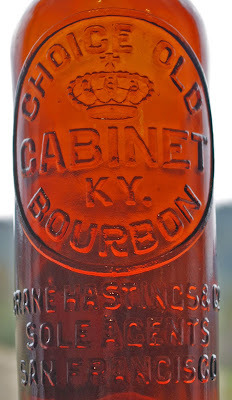 He goes on to add that sometime "prior to 1874, the Giles, Hayes Co. became known as Crane Hastings & Co." He further added that "Everett L. Hastings terminated his association with the firm sometime in the 1880's". I was curious to try to determine with some certainty, the years that each of the Choice Old Cabinet Ky Bourbon mold were used, and so set about documenting what I could about Crane Hastings & Co. through business directory listings and newspaper articles and or advertisements. What I found was a real eye opener. Repeat after me; Awww John - Not Again!? He got snippets correct, but about half of what was espoused turned out to be way off once the research was completed. Here's the real story. The first direct reference that I found for the partnership of Crane and Hastings was in the 1874 S.F. Business Directory. It lists Byron Crane involved with a firm by the name of Hayes Hastings & Co.. 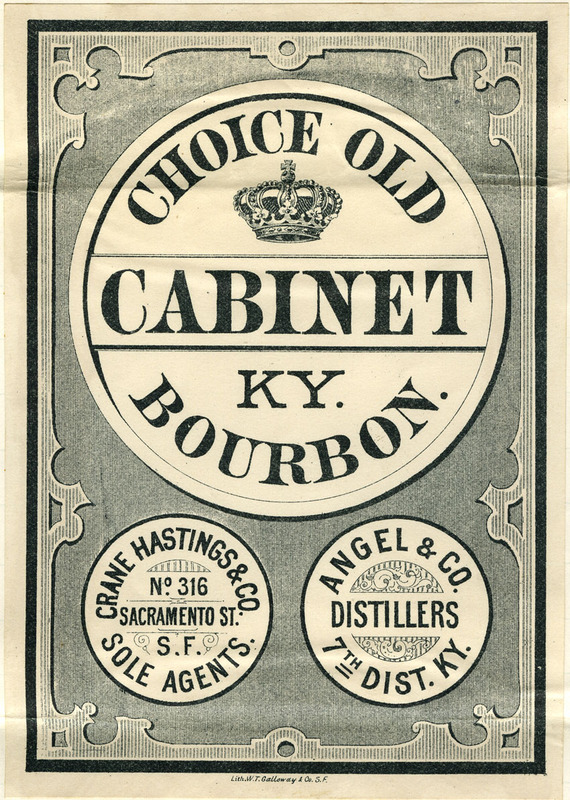 This supported Thomas contention that both Crane and Hastings had been involved together in a prior liquor wholesaling firm. However, there is no record of a Giles, Hays & Co. in any of the directories. The year 1875 ushers in the appearance of Crane, Hastings & Co. and the disappearance of Hayes, Hastings & Co. from the directories. One 1876 directory mirrors 1875. Yet another discrepancy pops up though - 608 Montgomery vs. 608-612 Front Street as the business address. But wait! A second listing in a competing S.F. directory shows Mrs. Everett L Hastings as being co-owner with Crane, and no reference to Everett, but at the Front St. address. Had Hastings skipped town or died? This article,from December 24, 1875 confirmed my suspicions. DOA. A subsequent newspaper article, dated April 5, 1876, popped up reporting the sole acquisition of the firm by Crane because no one else was interested in said business. So what had become of Everett L Hastings? It took some back tracking and digging, but I was finally rewarded with the rest of the story. And, would you believe that the Pacific Mail and Steamship Company of Hotaling / PMSS whiskey fame was interwoven into the plot?! The PMSS "Pacific" was a side-wheel steamer built in 1851. It was still considered seaworthy in 1875, despite having been owned by a succession of different companies. On November 4, 1875, she boarded passengers and freight in Victoria BC - Canada for the regular run to San Francisco in the climate of an unregulated and highly competitive market where passage was often offered free just to hurt the competing shipping line's business (the regular Victoria-San Francisco fare was $5 - about $200 in modern currency). Loaded to the gunwales and listing badly, efforts to right the ship included filling lifeboats with water to bring her to trim, and then doing the same with the lifeboats on the other side to re-compensate when the vessel began to list too heavily in the opposite direction. No lifeboat drills were held, and at a subsequent inquest it was revealed that even if the lifeboats had been available for use, only 145 passengers could have been saved, with at least another 155 left on board to go down with the ship (the official estimate of the number of passengers was 275, but as children paid no fare the death toll is believed to have been much higher). One of the passengers was none other than Everett L Hastings. Around 8 p.m. on the evening of November 4, the Pacific hit the SS Orpheus, although both vessels continued on their course and the captain of the Orpheus later testified he was unaware of the collision. With only a few PMSS Pacific lifeboats usable, some crew joined the women who had managed to get into one, in one case going so far as to throw out the husband of one woman despite her pleas to let her husband stay. None of the lifeboat parties survived, and went down soon after many of the 300-odd people struggling in the icy cold water drowned. The women drowned first because of the voluminous skirts then in fashion. An estimated 20 survived the sinking and managed to survive for a while by clinging to large pieces of wreckage. All but two of these eventually succumbed to hypothermia, as did one of the remaining pair, leaving Henry Jelley as only one of two survivors. Everett L Hastings was not one of the two. A newspaper article of the sinking simply stated; "The steamship Pacific went to sea yesterday morning, from Esquimalt, at 9 o'clock. She had on board nearly 200 miners and others as passengers from this place, and 120 United States soldiers from the Sound [Puget Sound]. Wells, Fargo and Co. shipped 205,998 dollars in gold dust. The total shipment, including the amounts in private hands, will reach 400,000 dollars." It seems that the "importance" of the loss of gold outweighed the loss of life. Another news article in the Daily Alta California shortly thereafter reported the recovery of the body of Everett L Hastings. An official announcement appeared in the Daily Alta California several days later. The Choice Old Cabinet Ky Bourbon brand was registered with the State of California on March 13, 1885, although it was most probably in use for many years prior to the firm shouldering the expense for a Trade Mark. Subsequent to the acquisition of the firm by Byron Crane, it was pretty much business as usual, although the firm both relocated and added a second location in the 90's. This would, no doubt, coincide with the new tooled top mold being commissioned. Byron handed the reigns over to his son Arthur H. Crane, in 1892. Sometime during the year 1895, with Arthur still at the helm, the company sold and shut their doors. Thomas states that the firm was purchased by a C.W. Craig. I did locate a listing for a CW Craig / Commission Merchant, located at the 316 Sacramento St. address (same as the last storefront of Crane, Hastings & Co.) in the "white pages". The business listings in the back of the S.F. Directory support Thomas's claim that Craig was successor to Crane, Hastings & Co.. Campbell W. Craig is listed under Liquors / Importers and Wholesale in the yellow pages section of the directory. 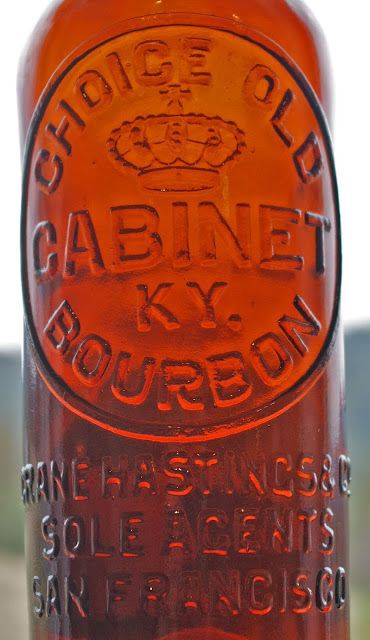 However, no references exist indicating that the blood line of Choice Old Cabinet Ky Bourbon continued on after the change of hands; thus ending two decades of merchandising success pushing Choice Old Cabinet Ky Bourbon (with the funny curved leg "R"'s). PS; Best guess is that the brand was paper labeled initially in the mid 70's. I'd conjecture that the glop top mold was commissioned after the Trade Mark was registered in the 80's, and the tool top mold replaced the worn out glop top mold (I've had a couple of glop Choices with literally burned out embossing) ca. early 1890's. 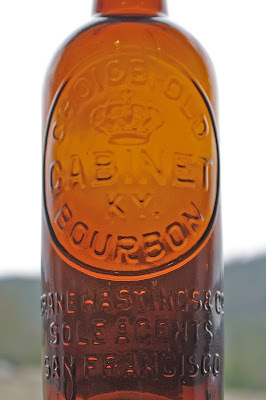 As such the latest whiskey with the sans-serif "R"'s that I can date with any degree of certainty is in the ca. 1892-1895 era. The Western "R" is not serif-ed but rather sans-serif. A serif is a line attached to the end of a stroke in a letter. There are no additional lines attached to the ends of either of the legs of the western "R". Sans-serif, means without from the French sans, so western "R"s are sans-serif. The only distinguishing attribute of a western "R" is its peculiar curved front leg.